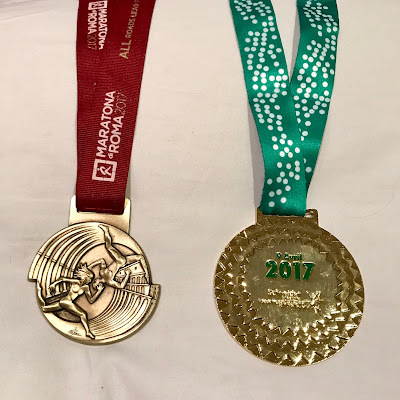 My adventures as Marathon Maniac #4436, Half Fanatic #1955, a Marathon Globetrotter and a 50 States Marathon Club finisher. I'm an RRCA certified running coach hoping to share with you my love of the sport. You’ve seen me write on this blog about training, or my lack thereof. I followed a regular training plan when I did my first few marathons. Then I set a training plan and largely followed it for my return to marathoning after a few years off. And then I started running multiple races close together in time. I found that I could always go the distance, even without consistent training. Not that I was fast, mind you…I could simply finish. I also sustained a few running injuries that had me cut back on my training mileage in order to “save myself” for my planned races. With one exception, my DNF at 2013 Atlantic City Marathon, I finished those races. But I always knew I could do better if I trained more consistently. I tried to set a plan for training over the past fall and winter, and at first I did OK, but then illness and then bad weather derailed me. If I’m honest with myself, I’ll admit that I just didn’t want it badly enough. I let excuses take over where willpower was lacking. And now that I’m about to finish my 50th marathon state in Newport, Oregon, my last scheduled race of the spring and summer seasons, it’s time to put the past to bed. I need to focus on the future and actually train. I have several important races scheduled for the fall, including two in Europe (Berlin and Jersey), and some local races such as the Navy-Air Force Half, the Army Ten Miler and the Marine Corps Marathon. I don’t want to simply finish these just under the time limit. I want to do better. I CAN do better. I’ve done better in the past. I WILL do better this fall. Saturdays – Long run with the Friends & Fitness half marathon training program. We started this Saturday at Yorktown High School with a 3 mile run around the track to place us into pace groups. It may seem like a step back for me to start my long runs at 3 miles, but my goal is to go faster than I've been running lately, and to build up the mileage at the faster pace. I know these people, I’ve run with them in past years, so it makes sense to start here. Eventually, I’ll need to do some longer training runs than what the group does. I’ll figure that out later. I can plan to start early to log my extra mileage and still finish with the group. Tuesdays – Run with Shirlington Running Club. I’ve been a member of the club since they started in 2009, but my attendance is not consistent. I need to get out of the rut I’m in and go run with my friends. It’s a short run of approximately 5K, after which we socialize. The club is moving to a new venue this summer (Samuel Beckett’s Irish Gastro Pub), so that will add to the excitement. Wednesdays – Evening track/hill workouts with the Friends & Fitness group. The workout is approximately one hour and each week there is a different speed or hill workout. I don’t usually plan speed or hill work into my solo runs, but it’s a good thing to do and I’ll do it if someone tells me to. I wish it was on Thursdays, so not directly following SRC, but it is what it is. And that’s it for now. It may look like an easy schedule to some runners, but it’s more than what I’ve been doing. I’ll try to stick with these three days with these two groups. If and when I find that I’m committed to this and am regularly completing these workouts, I’ll think about adding another run day or some cross training. I like to do strength training, so that would be a good addition. Or maybe yoga. If you see me in person or online, please ask me how my training is going. I need all the support I can get with sticking to the routine. Yea......totally with you on alla that. I feel like I'm starting at total square one.......because unlike you, I HAVEN'T been running at all in the past two months, and the weight gain is showing on me. Very true on needing to 'want it'.......I think that is my issue. I think I'm going to use the Hal Higdon Dopey plan this time around. More often running, but I like that it starts in June (vs July for Galloway), and I need SOMEthing to push me! Looking forward to seeing your progress! Maybe Bingo can help push you? But I did see your post about not having good running routes in your neighborhood. Thanks! My problem is that I never should have let it lag. I've posted my individual race reports from the Rome and Paris marathons, which I ran in early April. Here is a direct comparison of some of the aspects of each race. It was easy to do a direct comparison since I ran the marathons only one week apart. They were both good, but I preferred Rome. Part of this is because I feel more of an affinity for Rome and for Italy in general, so maybe I'm a little biased. However, I would recommend either of these marathons without hesitation. Just be sure you're up for a big city marathon. Rome had about 20,000 participants, and Paris had over 40,000! Some people run for the bling. That's not the only reason I run, but it sure is nice to receive a shiny medal to remember each of my races, or running challenges. I'm an RRCA certified running coach and a serial marathoner. When not running, I spend my leisure time enjoying good books, travel adventures and craft beer. I also spoil my three rescued cats. Finished My 49th Marathon State - New Jersey!